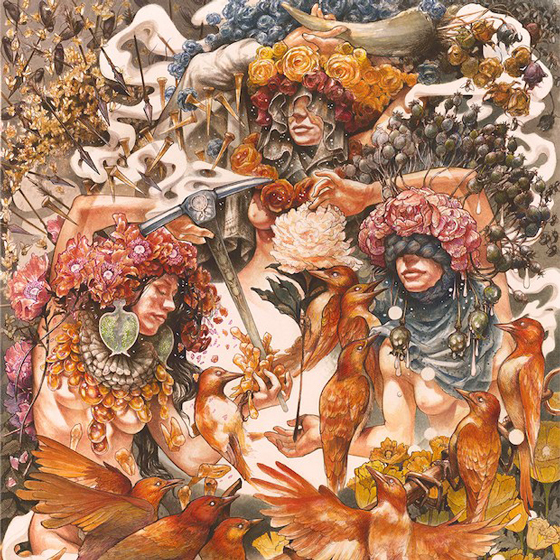 After unveiling the album's elaborate cover artwork earlier this week, Baroness have now shared the details behind fifth studio album Gold & Grey. Seventeen tracks in length, the album arrives June 14 through the band's own label Abraxan Hymns. Gold & Grey follows the band's 2015 effort Purple and was produced by Dave Fridmann. As frontman John Baizley confirmed earlier this week, Gold & Grey will also be the last of the band's chromatically-themed releases. Baroness have also shared a first song from the album in "Borderlines," which they have already performed live on their current co-headlining tour with Deafheaven. "I'm sure we have just finished our best, most adventurous album to date," Baizley said in a press release. "We dug incredibly deep, challenged ourselves and recorded a record I'm positive we could never again replicate." Drummer Sebastian Thomson added, "On Gold & Grey we have taken some unexpected paths on a labyrinthine sonic adventure. We accepted sounds and styles that have not appeared on previous Baroness albums, and I'm excited to welcome our fans into our new lair." See all the upcoming Baroness tour dates over here.